On short notice, a perfect weather window opened up for our second excursion to the area just west of Jordan Basin. On Tuesday November 30, we set sail aboard the Friendship V from Bar Harbor to learn more about the right whales on the potential mating ground. The constellation Orion was bright overhead as we left the dock at 4:45 a.m. and steamed out in the darkness. The seas were calm this trip and sighting conditions perfect. We found our first right whale just as the sun broke the horizon and worked a smattering of whales throughout the day. 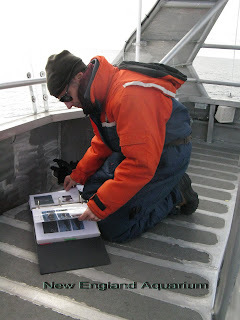 It was a very different day than our first- many humpbacks and fin whales in the same areas where we found right whales. We photographed a total of seven different right whales--none that we had seen on our first trip and no females this time. 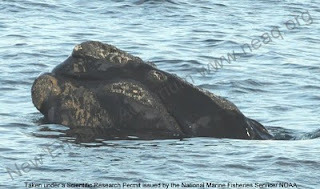 We found a number of big old males that we never or rarely see in the Bay of Fundy or on Roseway Basin including No. 1056 (shown above)--a male that was first seen 30 years ago. The right whales continued to be difficult to approach due to their erratic surfacings and inconsistent travel directions. We found a couple groups of two or three whales socializing (all males), but the quality of their behavior was very different from such groups in the Bay of Fundy or Roseway Basin. The groups on Tuesday were very slow moving, quiet, and one whale rarely came up to breathe-- a far cry from the often noisy and active groups in August and September [Check out photos and videos of active groups from the Bay of Fundy in 2008 and 2009, as well as this post from the fall describing a group in the Roseway Basin]. This subdued behavior is similar to some groups I witnessed back in the 1980's in Cape Cod Bay in February. It could just be an artifact of the small size of the groups we have seen near Jordan so far and we will see more energetic interactions when we find larger groups, or it could be that they are truly socializing in a different way in this habitat. It is exciting to try to understand their behavior in such a different habitat- it is all new! The Northeast Fisheries Science Center plane surveyed the area while we were there and photographed nine whales. They too found the whales difficult to photograph because they spent such short periods on the surface. Prior to this trip, we had seen a few whales that the plane had also seen, but not many. Tuesday was the first time we were both in the area at the same time and it will be interesting to compare the identifications from the two, very different platforms. We still haven't found any precious whale poop that would tell us what their reproductive hormone levels are, though we did have one moment of excitement when some volunteers on the bow excitedly announced that they smelled something really bad! We scrambled to get the net ready to collect a poop sample which floats on the surface for a while, but it ended up being a false alarm caused by a whale with particularly bad breath--something that has tricked us in the past. We will be looking for a good weather window for another trip in a week or two and this time will be hoping for a larger social group or SAG. Will these be similar to those SAGs we see 2-3 months earlier? Or be as different as the behavior we have documented so far? Stay tuned! Too bad you can't get one of those whale-poop sniffing dogs!